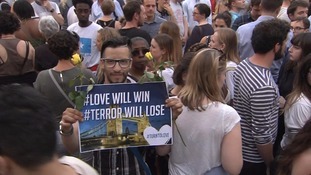 A man holds a 'love will win, terror will lose' sign. Hundreds of people joined a vigil in Finsbury Park less than 24 hours after Muslims were mowed down in a terror attack outside a mosque. One man was pronounced dead at the scene on Seven Sisters Road as worshippers attended Ramadan night prayers, while nine others were taken to hospital. Father-of-four Darren Osborne, 47, has been arrested over the attack and remains in custody. 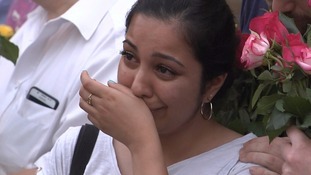 One mourner breaks down in tears. Mourners laid flowers and many carried signs with slogans such as "united against all terror' and 'love will win, terror will lose'. Brendan Cox, the widower of murdered MP Jo Cox, was also in attendance. The widower of murdered MP Jo Cox laid flowers. Dozens turned out to show their support. 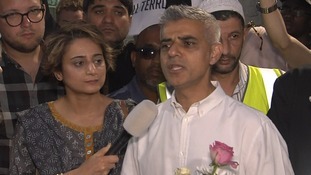 London Mayor Sadiq Khan told the crowd: "London is a resilient city. We are the greatest city in the world. "We've had a terrible few weeks though - with the terrorist attack on Westminster Bridge, the terror attack at London Bridge, and the awful, awful fire at Grenfell Towers. And of course last night, Seven Sisters. "But we are a strong city, and after this, we are going to show we are stronger, more united. "One of the things that all these terrorists share is perverse ideology that wants to divide our community - we're not going to let them." London Mayor Sadiq Khan addresses the crowd.